The Season 2 Colorverse Astrophysics Fountain Pen Ink has 8 great new colors. Each color comes in a two pack with a large 65ml bottle as well as a smaller 15ml bottle of the same color. 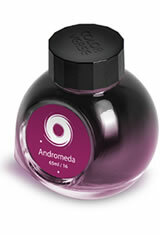 The Colorverse Astrophysics(65ml + 15ml) Fountain Pen Ink usually ships within 1 business day unless otherwise specified. Each Colorverse Astrophysics(65ml + 15ml) Fountain Pen Ink we sell is guaranteed to be genuine, authentic and will arrive brand new & unused! Dark Energy is a really wonderful ink; sort of a red/brown/mauve depending on the paper and pen, with lots of sheen and very good performance. Definitely a favorite. Colorverse inks are expensive, but they're nice. Supernova is a beautiful vibrant blue, and I love it. Along with Colorverse's Gravity Well, these are my two favorite blue-toned inks! I'd like to send out a shout-out to Pen Chalet for their awesome customer service - my first shipment arrived broken with ink spilled everywhere. It was very well packed, and there was no damage to the outside box (I think the two bottles must have hit each other during transit). Replacement was sent within days. Thanks, Pen Chalet - you have a customer for life. I have Dark Energy. It’s a cool color, but I bought it for the sheen, and there’s really only sheen on tomoe river paper. It flows nicely, and the packaging is incredible. Honestly, I think it’s overpriced for what it is. Great ink! Sadly, the box of two ink bottles arrived stained. I opened the seal on the box, and one of the bottles had leaked! It appears the lid loosened, and I lost a mL or two of ink into the box. I was told that since the box was sealed, they couldn't do anything about it. Sad, though, it ruined the box and some of the insert items. Not the end of the world, but disappointing!